This entry was posted on May 16, 2018 by applemoving. 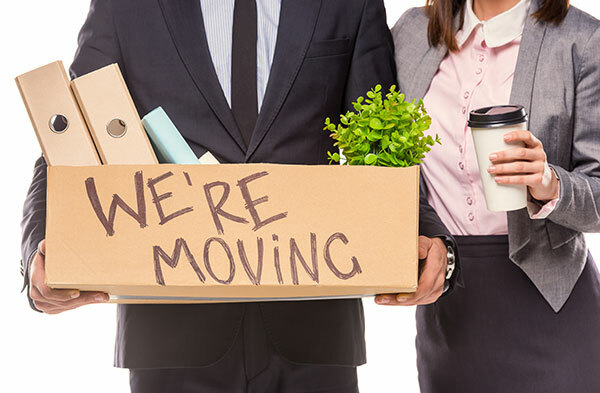 Commercial and office relocation often requires specialized packing and handling, compressed timeframes, or overnight scheduling. Apple Moving are experts in commercial and office relocations including workstation assembly/disassembly and many other commercial move requirements. Every commercial or office relocation service is unique. Minimizing business interruption is often the most important decision when selecting a mover. Apple Moving can offer a package to meet your specific demands with very competitive pricing and perfect service for your local or intrastate relocation needs, and we can also provide prep service for your cross-country or overseas move. At Apple Moving, we have knowledge to spare. Our experience and commitment to customer satisfaction make Apple Moving an unparalleled industry leader. With superb technology and efficient moving practices, we manage all office moves: floor-to-floor, across town, or intrastate, and we can also provide prep service for your cross-country or overseas move. Our reliable pricing keeps your budget secure, and we make every effort to ensure our clients experience is a move that will not compromise their business’ productivity. A Relocation Consultant will implement pre-planning to strategize the most optimal moving plan for our clients. Before your move, all necessary tags and boxes (including special containers for computers/servers, files, electronics, paintings, and mirrors) will be dropped off at your convenience. Apple Moving adheres to building protections, and in accordance with your building’s specifications, office floors and walls will be protected with wall coverings and masonite for your move. Our crew of experienced movers will carefully wrap and pack the contents of your entire office, including files, blueprints, fax machines, copiers, computers, furniture and pictures. We will utilize library carts to maintain order and integrity. Our crew will then pre-load items onto dollies to ensure quick elevator use on moving day. As prearranged, Apple Moving will provide you with a specialized crew to begin loading items onto our trucks. Our drivers are trained to apply the safest methods of transport to ensure your items arrive intact to your new location. Upon arrival, our crew will unwrap and setup your furniture to your complete satisfaction. Overall rating: 5.0 out of 5 based on 5 reviews. I had a need for an emergency move, less than 24 hour notice, and the team at Apple Moving DFW stepped up & took great care of everything. They were amazing. The crew foreman answered every question I had & took his time communicating with me. What a relief! The guys were awesome. Quick and great customer service. They took something I was dreading and made all my worry and concern go away. Two hours and they were DONE!!! And nothing was damaged, or scratched!!!! GREAT SERVICE!